15 years ago the Indian economy kick started but the bad news is that the north eastern states (and some others) didn’t ride along. The most recent news is that the north eastern states are “on a downward spiral.” While this may not be quite correct, what is true is that certain states in India did not keep up. At one time the income of the seven north-eastern states was above the national average and today it isn’t. Mizoram and Tripura are doing better and I wondered why. Well, these two states are the most dependent on agriculture, with 75% of Tripura’s economy dependent on it, and 70% of Mizoram’s economy. The states which are only half dependent on agriculture and depend on exports, tourism, cottage industries, food and timber products, chemicals and other industrial products have stagnated. Considering that the north eastern states are poor on infrastructure, whether it’s power, roads, airports or hotels, this stagnation is inevitable. Some of it has been underutilized, simply not spent due to inefficiency and tardiness. Some has been eaten up, a sorry tale of the whole of India. Whether it’s government babus, officials, politicians or contractors, in India it is some sort of a rule that a slice of developmental funds is set aside for thieves and anti-nationals. Some funds are diverted. Funds meant for rural development find their way into urban development, to build luxury hotels and malls. This creates a lopsided development model. Some developmental funds land up with terrorist outfits who do not allow any developmental works unless they are fed. And from businessmen to government employees, they all seek “protection” from terrorist groups. It’s becomes a vicious cycle of expenditure for the government, which is then forced to spend on increased security. Illegal Bangladeshi migrants not only add to the infrastructure woes of the state, these foreigners are often used by Pakistan based terror outfits. This creates a communal divide and more security problems. Politicians do not get rid of these foreigners due to vote bank politics. It’s not as if these problems are restricted to the north east alone. All states in India are infected with the corruption virus and many are afflicted with the insurgency bacteria as well. How much does money help? Clearly the solution is not to stop giving away funds, but I could not help comparing this to the controversy over foreign aid to poor countries. In fact criticism about foreign aid to poor countries has increased. Foreign aid has not worked well in sub-Saharan Africa. Studies have shown that just as countries with abundant natural resources tend to be laid back, countries dependent on foreign aid (which can be viewed as a resource, although an unnatural one) also tend to be laid back . What’s worse, political and business factions vie with each other to control the flow of resources and this leads to more corruption and infighting. In Africa for instance it is believed that Somalia’s civil war was caused by the desire of different factions to control the large food aid that the country was receiving. Ofcourse one can argue that foreign aid to developing countries and central government funding for poorer states are two different things, but I do think that there are lessons to learnt here. Demarking funds and handing over money to government departments is not enough. Unless good political and “policy” environments are developed, an unlimited flow of funds into the state coffers will not be used effectively. Why not do other things, like the central government increasing their efforts to find good domestic and export markets for the goods from the north-east and ensure good prices? More efforts can be made to lure reliable private parties into the states. Microfinancing can be expanded as well. The quality of educational institutions needs to be improved to ensure that people from the northeast get all the opportunities at their doorstep. Literacy is high, but the region does need good quality higher educational institutions. I am not an economist, and these are just my thoughts which readers are welcome to expand on. Read all posts on Development in India and the Indian Economy. More posts: All of India’s 8 north-eastern states are not disturbed areas! Well, for one thing, both are very remote and therefore not easily accessible to predatory outsiders (and no, I don’t mean the ones from Bangladesh and Myanmar), though I believe Indian Railways’ expansion plans are all set to change that. This is already being done by the Central government through its Look East policy and DONER project (Development of North East regions). The central govt. 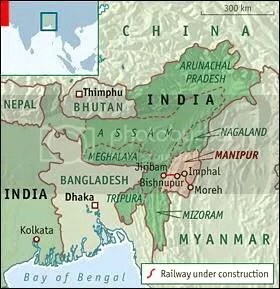 wants to tie up the North East market with those of the South East Asian countries thus creating a corridor between the North East and this region for free flow of goods and services. We have signed several MoUs with these countries in this regard and also an FTA with ASEAN which is expected to benefit North East states and accelerate development in the long run. States like Nagaland and Assam have serious insurgency problems and the government functioning in many districts are seriously compromised due to terror threats. Unless these are tackled its impossible for normal development activities to take place. ULFA and Nagalim terrorist groups have safe havens in Bagladesh and Myanmar. Unless we seriously engage these countries on talks and provide them enough incentives to wipe out terror camps these states will remain undeveloped. There is one more differnce between Mizoram, Tripura and the other NE states. These two have the highest literacy rate owing to the activities of both the state govt. and missionary activites (though I still hold the missionaries squarely responsible for radicalising many sections of the NE population against mainstream India). Infact the Central govt. is quite desperate to develop the North East states because of all the problems created by insurgents and vast underdevelopment of infrastrucutre owing to its harsh and rugged terrain. Giving the state govt. more autonomy to handle development projects will speed up things. The North East states also need more concentration on infrastrucutre development as they probably have the lowest road density in India and very little connectivity through rail, road links to the rest of India. I think by now it should be obvious that all development projects in India utilise efficiently only a fraction of the amount alloted to them. This problem is because of the way our bureaucracy has been designed and the attitude towards govt. jobs in general. Its a greater systemic problem as there is no reward, disincentive scheme in place. Unless something is done to reform the system thoroughly from inside the present trend will continue. Govt. officers don’t feel the need to perform and there is hardly any system to review their performance and hold them accountable for their lack of efficiency. Putting in place simple management techniques can turn things around but the politicians don’t want to antagonise govt. servants as they form a sizeable chunk of the voting population (people who actually vote as against those who hold candle light vigils but do nothing on the election day). Well about India in general we do know…we don’t find the North Eastern states in the news enough for us to even remember I guess(and even when they do, it seems to be for some fight/terrorism)….and I doubt how many even know that such states exist..
Of course the only way out is education(good proper education)..
no ideas about economy but yes one thing I am sure of 100 dollars come as aid..only 1 dollar reaches the needy in India. Perhaps funds should not be allocated to very broad programs; instead they should only go to very specific programs which can then be tracked and accounted for. Perhaps a special task force should be setup that moves from state to state to perform a specific task. That way, there is a face or a group of faces that can be held to account for the funds and work. The issue may be in pumping money into a complex matrix bureaucracy with vague development objectives. It becomes difficult to track the flow of money and the hands through which it passes. Vivek, well, even Arunachal is rather remote but it’s not doing that well. And as for the communism remark, well you know my views on that! Vishesh, a pity isn’t it. I hope this changes in the coming generations. Reema, corruption is the bane of many developing countries and India is one of the worst cases. sraboneyghose, that is a good idea. Although they have higher literacy than other parts of India, it’s not helping them. rags, thanks for that valuable input. Nita, private parties?! That would not bode well for accountability, right? Unless there is some govt oversight over the private enterprise. But then, that would be complicating matters 😦 I’m lost. Vinod, why not encourage private companies to set up shop there by giving them concessions and fiscal incentives? I mean it that way, another way of developing the area. in kerala we have panchayati raj and all developmental work for sanitation, road development, school and town development as well as employment generation under the rg yojana etc all come under panchayat and therefore there is quite a good amount of disbursement and development taking place. but of course, the people (not the netas but the aam-juntas) also matter! In Kerala at my hometown, for road asphalting and development work, ~ two localities who are not part of the panchayat governance body should give the go ahead before the funds are distributed to the contractor. In this way the contractor wont be able to get away with the fund without finishing the work. I think its a good system to get the citizens involved. I’ve always wondered why we can’t plug the corruption holes in India. And bring in Accountability. This shouldn’t be difficult to do. Fix responsibility and punish the offender. I guess this is one in the list of many things that are simply not done, tho they are simple enough to do – like bringing in a universal civil code, and enforcing police and prison reforms… and a plenty more. The 73rd and 74th Amendments to the Constitution of India provide a good deal of scope for involving and empowering citizens to participate in local governance, and to hold local bodies accountable for developmental works. I had written about N-E states in one of my posts recently.It is well known that of the amount sanctioned/disbursed for development ,only 17 paise reach the final destination. (so said Rajiv Gandhi–Rahul Gandhi recently had said that the situation has now worsened).Latest case of Madhu Koda proves this point. In my opinion,N-E is a completely neglected area.We /Govt/Media talk of Arunachal Pradesh only when China tickles us.We ill-treat most of the N-E girls in Delhi and call them chinkeys. In my opinion,the attention,developments depend upon the number of seats a state has for Lok Sabha.More the seats ,more the attention or otherwise. When did we last hear PM or Sonia Gandhi or Rahul Gandhi’s vist to any of the N-E states,except when there are elections round the corner. I have a few friends who don’t know what the names are of the north east states. And I think this must apply to some of the government people too. It’s unlikely that they really care as to what happens in the north-east of India. Many years ago I spent a couple of days with a senior IAS officer from Manipur, who was originally from the “mainland” but was very much in love with the state where he was serving. He told me how, many of the official letters that he received from Delhi, were addressed to [his name], [his designation and department], Imphal, Manipur, Assam. Your friends are in exalted company. Nita, When India got its independence Nehru was in love, in that state of mind he signed an informal aggreement with China, Tibet was to be annexed by China and India would look the other way and after 63 years the entire northeast of India would be handed over to China, unfortunately for China in 2000 BJP formed a govt., they refused to comply with the informal arrangement as it was informal. Now that congress is back in power China has upped its demand, meanwhile in the 62 years all the babus who worked in in the noetheast areas were aware that the entire region was to be handed over to China and being smarter than the Brits refused to develope it, the money allocated thus went into other channels so northeast will never be a developed region as long as it is a part of India. States like Nagaland, Meghalaya and Tripura have a potential to be made wonderful tourist destination, if not for the terrorism!!. Also, how many of us feel connected with the North eastern states? They say Assam is the “gateway” for north eastern states. Guess the gates were both opened and closed in Assam itself. Not many people know about rest of the north eastern states. These states have a potential to be self-sufficient. Like someone in the comments said, expanding Indian Railways would definitely help. Apart from money inflows to these states, something has to be done to culturally link these people with the rest of India. I know how all of us respect North Eastern states for their wonderful culture but remain helpless. Interesting post. My feeling is in most of the NE States there is genuine feeling of disillusionment with the Centre. As you pointed out the States in this area has not prospered with change of rule from London to New Delhi. Many there feel that many a time genuine democratic political movements are dubbed as separatist or terrorist and dealt with an iron hand by the Army. The Armed Forces Special Powers Act is seen widely as a repressive measure which fuels and accelerates terrorist movements as the space for democratic dissent is almost absent. The ten year old fast of Irom Sharmila is ignored and surrendered militants are killed in cold blood in broad daylight. Only a genuine democratisation, decentralisation and repealing of special powers of the security forces can provide a stable political platform for economic development. Corruption is something that we can never abolish. Sadly.